is an all-metal tail dragger designed solely for advanced aerobatics training and competition. The aircraft is larger than dedicated western aerobatic machines but sits low to the ground. The fuselage is semi monocoque, a combination of stressed skin and steel re-enforcement. The strong but simple main gear is semi-retractable, the lockable tailwheel permanently extended. The Yak 50 has no flaps. Flying controls are conventional and operated by control cables for the elevator and rudder, push rods for the ailerons. Only the elevator trim is adjustable in flight, the rudder and ailerons served by fixed tabs which are manipulated on the ground. Although the bending of the trim tabs is a two-handed job, the extreme flight loads experienced by this 360hp mini fighter can result in a reset being needed after a prolonged series of advanced aerobatic flights. The Yak 50’s powerplant is the ubiquitous Ivchenko M14 radial, the engine which powers all Yak and Sukhoi light aircraft. This supercharged nine cylinder radial delivers a whopping 360hp at max rpm and drives a variable pitched two-bladed paddle via a simple gearbox. The size of its propeller alone gives the Yak 50 a warbird look that is difficult to quantify. Fuel capacity on the basic aircraft is 11.4 imperial gallons (yes, you did read that correctly) contained in a single tank mounted aft of the firewall. Maximum flight endurance is quoted as 50 minutes and this figure can be halved during advanced aerobatic flights. The only good news is that the basic Yak 50’s pilot need never be stung for parking fees, the aircraft being permanently stationed next to the fuel bowser between flights. A welcome mod fitted to the vast majority of Yak 50s is the installation of a cruise tank which more than doubles the fuel capacity, although the G limits are reduced when full fuel is carried. In Russian tradition the Yak 50 uses pneumatics for engine starting, gear and brake operation. The aircraft’s air bottle will give around 12 start attempts before a recharge is necessary and a reserve bottle is also installed for emergency gear extension. The main bottle gets recharged automatically once the engine has started. The cockpit of the Yak 50 is smart and straightforward. Pilots with experience in other Russian light aircraft will immediately be at home and the rest will soon settle down once the novelty of Cyrillic lettering wears off. The overall layout is very much standard and operation of the various switches, knobs and levers are quite easy to get used to. The undercarriage lever is positioned on the left of the main panel, two green lights confirming that the gear is down and locked when the aircraft is on the ground. The throttle, rpm and lock lever form a meaty quadrant on the left shelf with another panel ahead comprising levers for the engine cooling gills and oil cooler flap. The extreme Siberian temperatures that this aircraft is designed to cope with result in a high degree of cooling control. Suffice it to say that for most of the year these levers will reside in the fully forward (open) position. The big red lever is the fuel shut off, replacing the emergency function of a mixture lever. Fuel mixture control is fully automatic for the Yak’s powerplant. The Yak 50’s instrument panel is slightly unusual at first glance due to the use of metric units. The first thing that most owners of eastern aircraft do when buying a Yak or Sukhoi is to replace the altimeter since it reads in meters. Otherwise the use of metric instruments quickly becomes second nature. And besides, it is nice to see an airspeed indicator needle pointing at the ‘280’ mark when in the cruise, even if this instrument reads in km/h instead of knots. The engine has two main control indicators, an rpm gauge reading from 0 to 100%, and a manifold pressure gauge reading in mm of mercury. Despite the presence of a constant speed prop, engine management really couldn’t be simpler. The throttle and rpm levers to fully forward for take off. After take off the prop lever comes back until the rpm gauge reads 82%. That’s all that needs to be done. In the cruise any ‘square’ setting will do, for example, for 70 on the manifold gauge set 70% rpm, for 60 manifold set 60%. It really is as straightforward as that. The Yak 50’s electric’s are in the centre of the panel and the fuel primer is located to the top right. The mag switch is the main electrical exception and this is mounted on the left of the panel next to the engine starter button. Climbing into the cockpit and strapping into the chunky five point harness, one is immediately aware of the ruggedness of the Yak 50. The surge of excitement when one gets into a 360hp single-seater for the first time is very hard to suppress. Visibility from the cockpit is excellent in every direction except, as might be expected, forwards. Engine start is where the fun really begins. First check that the battery master, ignition and mags are off, then turn the primer lever to the left and pump five times. Now turn the lever to the right and pump again simultaneously as a willing helper turns the prop. After nine prop blades have passed the windscreen, tell the prop turner to get clear. Switch on the battery, ignition and generator, open the throttle two inches and hit the starter switch. As the engine fires switch the mags to both and keep the engine going with liberal pumps of the primer. Don’t bother pumping the throttle – no accelerator pump is fitted and this will have zero effect. An easy mistake to make after start is to leave the primer turned to the right, when it should be centralised. The result is a slightly rough running engine, a fuel burn that is off the clock and an early engine overhaul if one ever makes it back to the airfield before running out of fuel. The start sequence sounds complicated and it is. The surprising thing is that even low-time PPL’s pick it up after two or three goes. Yak converts quickly get enough time to include an over-shoulder glance at the big waft of grey smoke accompanying a successful start. After a few seconds the engine settles down and it’s time to hit a few switches, adjust the radio, perhaps retighten the straps, acknowledge the admiring glances of those outside, and generally take it easy. I have yet to see a cold Ivchenko warm up to taxying temperature in less than five minutes, with ten minutes being more lit it on a standard UK day. When the oil temperature finally reaches its magic 40 degree point you can wake up and do the engine run, happily a simple affair after all of that starting palaver. Taxying requires a deft touch initially since there are two unusual aspects to Yak ground control. One is the differential braking which is applied by a stick-mounted hand lever and controlled by the amount of rudder applied away from its neutral position, the other being the fact that with the stick in the aft position, the Yak 50’s tailwheel will lock straight. This definitely takes a little getting used to. I occasionally found myself twisting and straining with the effort of getting the machine to turn, only to hear the calm, reassuring voice of aircraft owner Mark Jefferies on the radio, politely asking me to push the stick forward as I taxied slowly but surely out of control across the airfield. Take off for the first time in a Yak 50 is truly a mind-blowing experience. Remembering to push on the left foot (the prop goes round the ‘wrong’ way) and advancing the huge yellow throttle all the way forward, the aircraft surges forward like an F1 racing car. Acceleration from 0-60kts is in fact better than a Porsche 911SC and about the same as the current turbo model. Theoretically the correct procedure is then to move the stick forward once the aircraft is underway to raise its tail, although the time from stand still to take off is only just long enough to utter a couple of expletives and hang on to that left rudder before the Yak 50 is clawing its way into the sky at 3,000 feet per minute. Take-off roll is around 100 metres at MTOW. Once in the air the gear must be raised before the speed reaches 200kmh after which the prop rpm is reduced to a maximum 82% with full throttle. A more modest ‘70%, 70mm’ setting conserves engine life and slows things down a bit if the rookie pilot’s usual mount is a little more sedate, for example a Pitts or a Harvard…. With its power pulled back to the realms of the average light aircraft, the tiger turns back into the pussycat that its generous wing area and flight controls suggest. Control harmony is less than ideal, typically 3.2.3 for ailerons, elevator and rudder instead of the classical 1,2,3. The Yak 52’s heavier rudder and elevator forces give it a considerably better control harmony at the slight expense of manoeuvrability. Spades are an option on the Yak 50, to be considered for serious aerobatic pilots. The mod costs about £150, and I would recommend it. In pitch the Yak 50’s stick force per G is impressively light. This means that pulling up to the nine G maximum does not require the arms of Arnold Schwarzeneger. Save your strength for the rolling manoeuvres. I found that during advanced aerobatics I instinctively released the throttle to fly with two hands on the stick. It can only be assumed that the Russian women’s aerobatic and shot-put teams were interchangeable. Roll rate is impressive when compared with the likes of the Chipmunk and Beagle Pup but nowhere near that of the modern aerosuperplanes. Yak 52 pilots will notice that the Yak 50’s roll rate is slightly faster. The two aircraft’s’ wings are aerodynamically the same but the Yak 50 is several hundred pounds lighter. Advanced aerobatics aside, the Yak 50 is an absolute dream to fly. A power to weight ratio better than twice that of a Beagle Pup or Chipmunk means that the Yak 50 can be flown in a long sequence of manoeuvres without loss of height. With the aircraft wound up to its Vno of 400km/h (226kt) the Yak 50 can perform huge lazy loops, barrel rolls and wing over’s with low G forces. Its beautiful lines, impressive performance and thunderous roar make it absolutely perfect for air displays. Mark Jefferies’ D-Day colour scheme should keep him busy for a few display seasons to come. Stalls and spins of the aeroplane are surprisingly docile for a dedicated aerobatic machine. The Yak 50 loses less height than the Yak 52 during these manoeuvres due in no small part to its lighter wing loading. Stall and spin recovery are predictable and standard. During its debut in the ’76 championships, Western experts thought that the aircraft showed too much directional stability for an advanced aerobatic mount and this certainly manifests itself in the spin exit. Some advanced aerobats have to be positively wrestled out of an established spin. The Yak 50 is one of the exceptions. In the cruise the Yak 50 is a delight to fly. Like the Yak 52 it goes exactly where pointed, the powerful and deadbeat flying controls giving a great degree of precision without too much attention having to be paid. The 10 litre radial up front provides impressive performance and a cruise speed of up to 280km/h (151 Kt) is achievable without sapping engine life. The Yak 50 can actually sustain its max level speed of 300km/h (162 Kt) if desired, since full throttle and 82% are the quoted maximum continuous power setting. In reality, unlike the Russian aero team’s Yak 50s, UK-based aircraft are likely to be privately owned and a major engine overhaul every 500 hours will want to be avoided. The greatest downer to life at 162kt is the Yak’s fuel capacity, or lack of it. With a standard 55 litre fuel tank fitted, an airfield will be needed every 60nm when cruising at this speed. A more sedate 200km/h (108kt) improves the range to 85nm. With a cruise tank fitted the aircraft’s best range jumps to 250nm at economy cruise. Given such a short range, a GPS is a very desirable installation for a Yak 50. When flying cross-country, accurate measurements of distance and time-to-run to a destination can then be compared with the range and endurance when airborne. The next generation of GPS machines will allow fuel calculations to be directly imposed on the raw GPS information, giving the user an accurate and constantly updated ‘fuel at destination’ calculation, and this will be even better news for pilots of aircraft such as the Yak 50. In the circuit the Yak is easy to operate. The sum total of good all-round visibility, draggy aeroplane and high power results in a slick approach every time. The undercarriage can be lowered at 200km/h or less and an approach should be flown at 150km/h, reducing to 100km/h at the threshold. The speed reduction on finals requires the throttle to be closed early and the aircraft held off until the speed bleeds back. The Yak’s large wing and short undercarriage can cause an excessive float if the airspeed is too high on landing. With repeated practise the Yak can be brought to a halt in 150 metres on a dry surface. Owning and operating a Russian aircraft might seem like a daunting prospect for the average European pilot. In reality this is far from the case. Yaks and Sukhoi’s are no longer a minority in the west and spares support are available from several organisations in Europe. The test aircraft was imported by Yak UK, a Bedfordshire-based firm holding sole export rights for new Yaks in the UK. Yak UK have imported a number of eastern aircraft over the past few years and hold an ever-growing engine and spares inventory as well as providing expert maintenance. Vintage Engine Technology are also on site at Yak UK’s base and can overhaul or rebuild any part of a Yak radial. Good Yak 50s currently sell for £35,000-£45,000 and prices will go higher as the sources for this rare beast dry up. Unlike the Yak 52, the ’50 is out of production and factory-refurbished examples are no longer available. Despite its relative complexity the Yak’s build quality and inherent reliability puts its running costs under half that of equivalent Western machines. For an annual usage of 100 hours, the total costs per hour are in the £50-£60 region, rising to £60-£70 per hour if an engine fund is included. In European hands, and with European oil, the Ivchenko should be good for up to 2,000 hours between overhauls. With a comparable Pitts in the £1000 plus per hour league the Yak 50 makes good economic sense. The cost of Yak spares is still ridiculously low. A new Ivchenko can be purchased for around £7,000, less than half the cost of the 220hp radial bolted to the front of a Stearman. A new Yak prop currently costs around £2,000, less that a quarter the cost of an equivalent VP unit in the west. 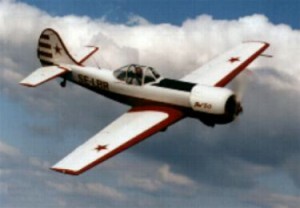 Eastern bloc aircraft such as the Yak 50 and 52 have caused a minor revolution in the GA habits of the western world. For sheer economy and thrills per pound these flying machines can not be matched. For many private pilots, warbird flying no longer has to be a spectator sport.